This has back tested the breakout point today...Im long on this with a stop below the low of today. Keep an eye out for a channel breakout.??? why i favour a breakout. Funny enough I always thought I was disciplined (in life anyway) but crickey you need some serious discipline in this share malarky, got to get out of this "it will turn up anytime now" and "I will just move my stop down a touch" attitude I think as now recognise this is exactly how I have been losing my hard earned. Reading your FTSECharts as well as this site is like a breadth of fresh air when your in a rut and don't know where to look for help. Discipline is also key. Don't try and anticipate moves. 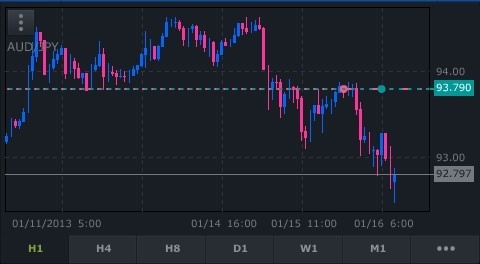 Use stops and take some profit at first resistance. As a complete newbie to all this T/A, and getting very confused at this stage, this post makes total and utter sense to me and will hence forth not use line charts from now on, and maybe, just maybe my brand new spread betting account may just start going up rather than down. This is just for education purpose. If you look at the chart below you can see how perfectly the currency pair bounced of the major trendline today. How many times have people seen this happen on chartsview. Is it fluke. I dont think so.This is the advantage of trading of a major trend line on a first attempt basis. You could only do this type of trading if you use good charting packages and only use candlestick charts or bar charts. For me accuracy is every thing and you need much info as possible when trading with trend lines. Line charts cant give you this type of trade. If you were using line charts for this pair then you would still be sitting on the sideline waiting for the trade. The other disadvantage on using line charts for short term trading is the amount of whipsaw in your trading.Line charts are plotted on the end of day closing price basis so all those important levels where it traded at would not be registered. So if you were to trade using line charts as your trend lines then you would end up placing a lot more trades that fail due to stoplosses activating. Also if you look at the charts you can also see what generally happens when a trend line breaks. Prices can fall hard. So the moral of the story is ,respect trend lines and learn to plot them correctly. The above is just for learning purpose and based on daily charts. Last Edit: 13 Jun 2013 19:06 by remo. Nice hammer formation on this one. id go long half way down hammer with stops below. This trade has been a rollercoaster ride..
Possible long half way down the hammer with stops below. This appeared right at support. The only problem with this is that its a very volatile currency pair and the stops are far apart. 2parts taken and stop at break even. Last Edit: 16 Jan 2013 10:03 by Rossymc.